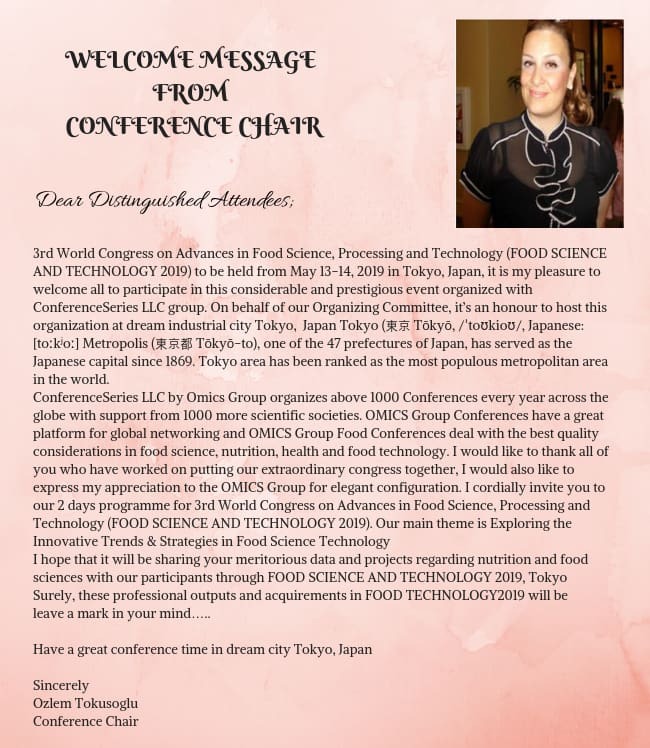 Conference Series LLC LTD is privileged to announce the World Congress on Advances in Food Science, Processing & Technology Conference which will be held in Tokyo, Japan during the month of May 13-14, 2019. We prayerfully welcome all the eminent researchers, students and delegates to take part in this upcoming Conference on Food Science to witness as a valuable scientific discussion and contribute to the future innovations in the field of Food Science, Processing and Technology. This International Food Science and Technology Conference features the topic, which mirrors the Innovative advancement in Food Science Research and gives a profound nature into the most recent Discoveries and Technological Advancements in the field of Food Science. The two days of the Conference incorporates Food Science Workshops, Oral and Poster Presentation, e-Posters, Young Researchers Forum, Symposiums, Career Guidance Sessions for Academicians, Doctors, Professors, Scientific Experts, Researchers, Dietitians, Nutritionists, Technologists, and the Specialized Pioneers, uncommon keynote sessions directed by famous and prestigious speakers to encourage the advancement in the field by contributing with their mastery, who exceed expectations in the field of Food Science which incorporate the subjects Food Science, Processing and Technology, Food Chemistry, Food Biotechnology and Microbiology, Food Innovation, Food and Nutrition, Food Microbiology, Food Safety, Food Processing, Advances in Food Preservation, and Packaging, Food Law and Economy. 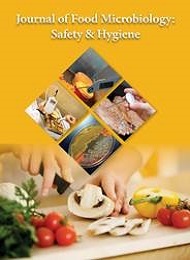 The International Food Science and Technology Conference focuses on learning about the significant Trends in Modern Food Processing, Drawbacks, and its Hygiene, Food Preservation, and the Advanced Technologies in Food Processing, and it forwards in making a better Health; this is going to be a Best opportunity to influence the largest Assemblage of participants from the Food Science community. Conduct presentations, meet with current and Specialized Potential Scientists and Researchers, make a splash with new Innovative Processing Technologies and developments in Food Science, and receive Name Recognition at this 2-day International event. World-renowned speakers, the most recent techniques, and the newest updates in Food Technicians are hallmarks of this Conference. We also welcome the Renowned Presidents, CEO’s, Delegates, Doctors, Nutritionists, Professors and Industrial Executives from Food Science, Nutrition and Health Care Sectors making the Congress a perfect platform to Network, share views and knowledge about new discoveries and technologies through interactive keynote, plenary, poster and B2B discussions. Food Science Technology, that will concentrate on sustenance Technologies in the Advancements of Food Processing, Food Engineering, Food Microbiology, Bioprocess Engineering, Agriculture, Aquaculture, Food Chemistry, Food Packaging, Food Safety, Nutrition and Diseases brought about by Food. We are charmed to call upon Food Technologists, Nutritionists, Academicians, Industrialists and Dieticians, Food laureates, Scientists, Researchers, Entrepreneurs everywhere throughout the world to assemble to examine the advances in Food based Research Technologies which help in guaranteeing the Quality, Safety and Control of Food Products. This occasion conveys driving judgment skills to a stage for a roundtable talk on Advances in Food Science and its preparing and Technologies. This is an Innovative stage to talk about the focused on advancement to feed and Treat the Challenging World. Food Science and the preparing Technologies are blending multidisciplinary field that envelops total Advanced information of the organic, physical, Chemical and building sciences which are utilized to grow brand new Advanced nourishment items, plan to handle advances, improve the nature of nourishment, increment its nutritive esteem and protect the healthiness of sustenance supply and furthermore to diminish. Sustenance Science standards incorporate essential sciences, for example, Food Chemistry, Food Biotechnology, Genetics, Microbiology, Food Nanotechnology, Food Engineering, Food and Nutrition to furnish customers with innocuous, nutritious nourishment items that add to their wellbeing. Sustenance Science mixes science, material science, building, and nourishment to find approaches to improve the security and prosperity of individuals. This International Conference on Food Science intends to incorporate the huge and Innovative names over the globe to come down to a typical, share a typical stage and broaden their insight among future specialists, business visionaries just as the agriculturists who dedicate their work and time to give nourishment to the whole world. It is an interdisciplinary stage to develop a system from the base to the best among the general population related to Food Science. Food science basically means the study of food. It can also be defined as the process in which the Chemistry, Engineering, Biological, and Physical Sciences are used to study the Nature of Food, its causes of deterioration, the Principals involved in processing Technology and its advanced improvements for providing the Nutrition and Treatment for Public Health. Food scientists carry out various processes which include the advanced development of New Food Products, choice of packaging materials, Novel Food Technologies, half-life and shelf life studies, sensory evaluation of products & microbiological testing. The Conference will be mainly focusing on collective challenges posed by varied aspects of Advanced Food Science Technologies, Food Processing, and Food Quality, ranging from global to indigenous issues in Food Safety, Quality and Food Hygiene. Food Processing is the change of crude fixings (raw ingredients), by physical or concoction implies into sustenance, or of nourishment into different structures. The processing of Food combines raw ingredients to produce marketable food products that can be easily prepared and served by the consumer. Sustenance handling consolidates crude nourishment fixings to deliver attractive nourishment items that can be effectively arranged and served by the purchaser. The procedure commonly includes exercises, for example, mincing and macerating, liquefaction, emulsification, (for example, bubbling, searing, broiling, or barbecuing); pickling, purification, and numerous different sorts of protection; and canning or another bundling. Food Chemistry is the investigation of compound procedures and cooperation’s of all natural and non-organic parts of nourishments and manages the headway of the science and natural chemistry of nourishment or the explanatory strategies/approach utilized. This control likewise envelops how items change under certain nourishment preparing methods and ways either to upgrade or to keep them from occurring. These ideas are frequently drawn from rheology, speculations of transport wonders, physical and concoction thermodynamics, substance bonds and communication powers, quantum mechanics and response energy, biopolymer science, colloidal connections, nucleation, glass changes and solidifying/cluttered or non-crystalline solids, and in this manner has Food Physical Chemistry as an establishment zone. Food Toxicology is the study of the nature, properties, effects and detection of toxic substances in food and the disease manifestation and covers various aspects of food safety and toxicology, including the study of the nature, properties, effects, and detection of toxic substances in food and their disease manifestations in humans. Food and nutritional toxicology deal with toxicants in food, the health effects of high nutrient intakes, and the interactions between toxicants and nutrients. It deals with food allergy, food intolerance and metabolic disorders, food irradiation radioactive elements, heavy metals, or the packing materials used in food processing. It also deals with Global Trends in food safety and technology, Food Biotechnology, Food chemistry, Techniques for assessing potential toxicity, Food Science, Food and chemical toxicology, Food Engineering, Nutrition research and technology, Agricultural and Food Research, Product development and quality assurance, Food fortification, Novel methods in food safety, Innovative and Emerging Technologies, Food Microbiology, Food contaminants, Diabetes control and Environmental Pollutants, Mechanisms underlying toxic phenomena etc. Nanotechnology is technology is performed at the Nanoscale and it can refer to the creation of new nanomaterial with specific properties or the use of nanomaterial in technology and also use of an existing technology to produce nanoparticles. While many naturally-occurring nanomaterials existed. Food Nanotechnology advances have been applied to innumerable industries ranging from electronics and batteries to medicine and food products. In the food industry, nanotechnology has been utilized in order to enhance the delivery of food ingredients to target sites, increase flavour, inhibit bacterial growth, extend product shelf life and improve food safety. It involves the manipulation of microscopic matter that ranges from 1 to 100 nm in size. Because food and water are naturally made up of particles that are on the nanometre scale, engineered nanoparticles are able to penetrate these products easily based on their similar properties. These particles can act as a whole unit by performing similar transportation functions that prove useful in almost every industry, particularly involving food products. Food Microbiology is the investigation of microorganisms that colonize, change and process, or sully and ruin sustenance, during the Food Process. It is a standout amongst the most various research territories inside Microbiology. It incorporates a wide assortment of microorganisms including decay, probiotic, fermentative, and pathogenic microscopic organisms, moulds, yeasts, infections, prions, and parasites. Microbial Food Biotechnology Research is basic for advances in Food Production, nourishment wellbeing, sustenance security, esteem included sustenance items, practical sustenance’s and Human Nutrition, just as encouraging central research in biotechnology and the Agricultural Sciences. Biotechnology refines and expands techniques that produce new plants and creatures. Microbial Cell Factories introduces the 'Microbial sustenance biotechnology' arrangement to cover the cell manufacturing plant parts of the abuse of microorganisms or their parts and chemicals in nourishment creation. Potential subjects incorporate, yet are not restricted to, microbial physiology, Biochemical Engineering, Genetic and Metabolic Engineering and Biotechnology of Food Microorganisms. Each organic product, vegetable, grain and the residential creature we see today is the aftereffect of Genetic Modification. Food Security, as the condition in which all individuals, consistently, have physical, social and financial access to adequate protected and nutritious sustenance that meets their dietary needs and nourishment inclinations for a functioning and solid life. Over the coming decades, an evolving atmosphere, developing worldwide populace, rising nourishment costs, and ecological stressors will have huge yet exceedingly dubious effects on sustenance security. Family unit sustenance security is the utilization of this idea to the family level, with people inside families as the focal point of concern. Food Engineering is a multidisciplinary field which consolidates microbiology, connected physical sciences, science and building for sustenance and related businesses. Nourishment building incorporates, yet isn't constrained to, the use of horticultural designing, mechanical designing and synthetic building standards to sustenance materials. In the advancement of the sustenance building process, one of the numerous difficulties is to utilize present-day instruments, innovation, and learning, for example, computational material science and nanotechnology, to grow new items and procedures. At the same time, improving quality, wellbeing, and security stays basic issues in the sustenance designing investigation. New bundling materials and procedures are being created to give more security to nourishment, and novel conservation innovation is developing. Food Packaging and Preservation investigates on-going ways to deal with protecting and dragging out the sheltered utilization of nourishment items while likewise keeping up the properties of new sustenance. The Conferences contains profitable data and clever thoughts with respect to as of late researched bundling procedures and their suggestions for nourishment bioengineering. Terrible eating routine exacerbates some wellbeing conditions much. A few sicknesses are better treated by an adjustment in eating routine than by a pill. Be that as it may, the healthful exhortation is difficult to pursue when a patient is too poor to even consider knowing where the following feast is originating from or lives in a spot without simple access to new foods grown from the ground. Numerous patients may not know, also, how to set up the correct sustenance to get their endless sicknesses levelled out. At that point here comes the sustenance drug store into play, wherein an on-going contestant in the developing nourishment as-medication development, in view of the possibility that clinics and other social insurance suppliers can play a progressively dynamic job in advancing weight control plans that can help inpatient treatment. The Fundamental Concept of Food Education is to expand the information of, the enthusiasm for and the capacity to settle on decisions concerning nourishment and wellbeing and sustenance and sustenance quality. Nourishment training can impact the perspective on sustenance decisions and dietary patterns. It can rouse us the significance of products of the soil and non-prepared sustenance. It might even shape their point of view on wellbeing and wellbeing for whatever is left of their life as we probably are aware Health starts at home and is accentuated at school. The four fundamental segments: wellbeing, nourishment, sustenance, and condition. Clinicians and teachers that are intending to rebuild wellbeing programming and take it to the following dimension and without knowing how nourishment is developed; we will never see how it impacts our wellbeing and health. Food Biology alludes to our physiological needs to give the essential determinants of nourishment decision. Its natural qualities decide our nourishment choice and the job of hunger, tastefulness and taste in sustenance decision. People need vitality and supplements so as to endure and will react to sentiments of appetite and satiety. When all is said in done, people can choose their nourishment from a wide range, be it of plant or creature inception. Food and Nutrition is the science that translates the communication of supplements and different substances in sustenance in connection to upkeep, development, generation, wellbeing and malady of a creature. It incorporates sustenance admission, retention, digestion, biosynthesis, catabolism, and discharge. The eating routine of a creature is the thing that it eats, which is generally dictated by the accessibility and agreeability of nourishment. For people, a solid eating regimen incorporates planning of sustenance and capacity strategies that safeguard supplements from oxidation, warmth or filtering, and that lessens the danger of foodborne ailments. The viable administration of sustenance admission and nourishment are both keys to great wellbeing. Brilliant sustenance and nourishment decisions can help anticipate sickness. Eating the correct sustenance’s can enable your body to adapt all the more effectively to an on-going sickness. Seeing great nourishment and focusing on what you eat can enable you to keep up or improve your wellbeing. Dairy Science centres on the natural, synthetic, physical, and microbiological parts of milk and on the innovative parts of the change of milk into its different customer items, including refreshments, aged items, focused and dried items, spread and frozen yoghurt. Mechanical advances have just come about very as of late in the historical backdrop of milk utilization, and our ages will be the ones credited for having diverted milk handling from craftsmanship to a science. The accessibility and appropriation of milk and milk items today in the cutting edge world is a mix of the hundreds of years old learning of conventional milk items with the use of Modern Science and Technology. Nutritional Disorder is a healthful irregularity which is expected to either overnutrition or undernutrition and brought about by a lacking admission of sustenance or of specific supplements, by a failure of the body to retain and utilize supplements, or by overconsumption of specific nourishments. It might cause the nearness of poison in the eating routine. Insufficiency of explicit supplements is regularly connected with confusion. It incorporates a wide range of conditions, including summed up undernutrition, overnutrition prompting stoutness, the dietary issues and maladies where sustenance has a job in the etiologic Condition. Comprehensively, both undernutrition and weight are imperative general medical issues. wellbeing is a logical control portraying dealing with, planning, and capacity of nourishment in manners that counteract foodborne disease. This is accomplished through great cleanliness and dealing with practices. cleanliness is the conditions and measures important to guarantee the wellbeing of nourishment from generation to utilization. Nourishment can wind up sullied anytime amid butchering or reaping, handling, stockpiling, appropriation, transportation and planning. This guarantees sustenance is fit for human utilization and keeps away from nourishment harming, which is an intense, irresistible or lethal ailment, generally of sudden beginning, brought about by the utilization of tainted nourishment or water. Sustenance wellbeing contemplations incorporate the starting points of nourishment including the works on identifying with nourishment naming, nourishment cleanliness, nourishment added substances and pesticide build-ups, just as arrangements on biotechnology and nourishment and rules for the administration of legislative import and fair examination and accreditation frameworks for nourishment. The Division of Food Systems and Bioengineering incorporates different scholarly and augmentation programs and Food Bioengineering gives an effective answer for sustenance emergencies. There are four scholarly projects in the Division: Agricultural Systems Management, Food Engineering, Food Science, Hotel and Restaurant Management. The absence of learning and mindfulness with respect to the present circumstance, issues and logical advancement of latest advances and their practical possibilities contribute essentially to the low improvement and usage of novel methodologies identified with bioengineering of sustenance. It improves wellbeing and personal satisfaction by propelling medicinal innovations for malady analysis and anticipation; and upgrading the utilization and conveyance of horticultural yields as top-notch sustenance and non-nourishment items to customers in a protected, effective and naturally inviting way. Food loss and waste is a growing problem in modern society. Food-scrap recycling has multiple benefits. Food scraps can be used for composting, which enriches the soil and reduces emissions of methane (a potent greenhouse gas) from landfills. It also significantly reduces the volume of landfill needed in a given area. And recycling food can save cities and towns money by lowering the needed frequency of trash collection. Recycling your food and other organic waste is a fresh idea that can produce both economic and environmental savings. This naturally efficient, budget-friendly disposal alternative from Food Waste Management can benefit your company, your community and the environment. · Raise your recycling rates. · Choose a cost-effective disposal option. · Foster a green image among your employees and customers. The Food Market Survey studies the inflow of Foreign Direct Investment (FDI) and its annual Growth rate in the Food Processing industries in India. The survey also analyses export of Food products and points out strengths, weaknesses, opportunities and threats to the food processing industries in India. Agriculture and industrial segments of the economy. Strengthening this link is of critical importance to improve the value of agricultural produce, ensure remunerative prices to farmers and at the same time create favourable demand for Indian agricultural products in the world market. A thrust to the food processing sector implies the significant development of the agriculture sector and ensures value addition to it. FDI with up to 100 per cent equity is permitted under the automatic route in food and infrastructure such as food parks and cold chains. There are many areas for investment in this sector such as mega food parks, agri infrastructure, supply chain aggregation, logistics and cold chain infrastructure, fruit and vegetable products, animal products, meat and dairy, fisheries and seafood cereals, consumer foods/ready-to-eat foods, wine and beer and machinery/packaging. Though India has a strong raw material base, it has been unable to tap the real potential for processing. The global market value of ethically labelled packaged foods is projected to grow from 793.3 billion U.S. dollars in 2015 to 872.7 billion U.S. dollars by 2020. The future of the functional food market looks bright; the worldwide revenue for functional food is projected to increase from about 300 billion U.S. dollars in 2017 to over 440 billion dollars in 2022. At present, there is no universally accepted definition of functional foods. But, according to the International Food Information Council (IFIC), functional foods are “foods or food components that may provide benefits beyond basic nutrition”. Popular product types worldwide include vitamins and dietary supplements, functional beverages such as sport and energy drinks, as well as products fortified with probiotics. Revenue in the Food market amounts to US$660,831m in 2018. The market is expected to grow annually by 3.0% (CAGR 2018-2021). The market's largest segment is the segment Meat Products & Sausages with a market volume of US$139,792m in 2018. In global comparison, most revenue is generated in the United States (US$660,831m in 2018). In relation to total population figures, per person revenues of US$2,015.64 are generated in 2018. The average per capita consumption stands at 403.8kg in 2018. Fairtrade products have grown increasingly more popular in recent years. In the early 2000s, it was uncommon to see anything other than fair trade coffee or tea, but the market has since expanded to include fair trade sugar, honey, wine, apparel, coconuts, and seafood to name a few. UTZ, an organization that certifies products as sustainably farmed, reported that the global production value for sustainably produced cocoa grew from 918,000 metric tons in 2015 to nearly 1.2 million metric tons in 2016. · Revenue in the Food & Beverages segment amounts to US$90,173m in 2018.
market volume of US$138,905m by 2022. · User penetration is 20.3% in 2018 and is expected to hit 26.3% by 2022. · The average revenue per user (ARPU) currently amounts to US$86.30. · In global comparison, most revenue is generated in China (US$18,521m in 2018). In the market for Milk Products, the volume is expected to amount to 29,104.6mkg by 2021. The Global Dairy Processing equipment market is projected to reach USD 10.90 Billion by 2020, growing at a CAGR of 5.4% from 2015 to 2020. The major drivers are the rising global consumer demand for dairy products, increasing dairy production, changing needs, taste & preferences among consumers, and the growing demand for healthier and palatable dairy products. The rising health consciousness among people has increased the consumption of processed dairy products such as skimmed milk. In the Food market, 3.6% of the total revenue will be generated through online sales by 2021. The Average volume per person in the market for Milk Products amounts to 89.2kg in 2018. · Revenue in the Bread & Bakery Products segment amounts to US$67,987m in 2018. · The market is expected to grow annually by 2.6% (CAGR 2018-2021). · In global comparison, most revenue is generated in the United States (US$67,987m in 2018). · In relation to total population figures, per person revenues of US$207.37 are generated in 2018. · The average per capita consumption stands at 42.5kg in 2018. The average volume per person in the market for Bread & Bakery Products amounts to 42.5kg in 2018. The principal factor escalating the growth of the processed seafood market is the changing lifestyle patterns and demographics of seafood consumers worldwide. People have become more prone to the consumption of products that would supply their health benefits. This report estimates the market size of the processed seafood market in terms of value. Fish, molluscs and crustaceans are the major types of seafood. Frozen products, dried products, smoked, canned and supreme form the chief product types of processed seafood. In terms of geography, the report is segmented into North America, Asia-Pacific, Europe, and Rest of the World (ROW). With the rising keenness for value-added seafood products, the market is likely to observe significant growth in the future. In the functional foods market, the products targeting health and mental well-being have prompted the food industry to increase research and development of these new foods. Despite the uncertainties of existing regulations, outlining the context of a rapidly expanding market in main countries. 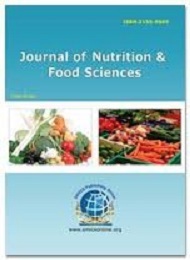 This paper provides an overview of the current situation in the global market of functional foods. The objective of this analysis is to determine whether, and in what way, the field of functional foods can actually be an opportunity both for food companies, in terms of economic benefit, and for consumers, as an opportunity healthy products. 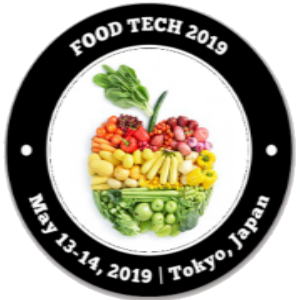 Food Tech 2019 in Tokyo, Japan will be the World Congress on Advances in Food Science, Processing and Technology Conference covering the history, Technologies, and Trends of Food Science and Advanced Processing Food Technologies catered to Industry Professionals and Academic communities worldwide. We are assembling a distinguished editorial board and we invite you to join us. 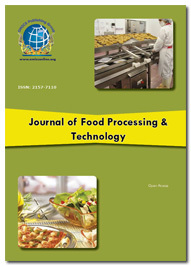 Please check out our call for papers in 20 tracks and 167 sessions encompassing the vast field of Advanced Food Science and applications in Novel Food Processing Technologies. During the last decades, Food Science and Technology has become a widespread and sophisticated branch of Food Science due to constant & high-quality research. In this conference, we will discuss up-to-date and research works which advance the Processing of Food Technologies in the field of Food Science. The topics are selected to be of scientific importance and at the same time to be comprehensible and understandable with basic knowledge of Food Science and Processing Technologies and its application. The journal process articles through Editorial Manager System for quality publication in a rapid peer review process. Editorial Manager is an online manuscript submission system which reviews and processes the articles and makes it easy for the author, editor and reviewers to work simultaneously with easier review strategies and protocols. The review process is executed by the editorial board members of journals or outside experts; at least two independent reviewer’s approval is mandatory followed by editor approval is required for acceptance of any citable manuscript. Authors can have a track on their valuable submissions any time to finally co-operate for processed article submission. Online system entitles the reviewers to download the relevant manuscripts and submit their opinions to the editor. The editor can manage and monitor the complete submission/review/revise/final publication process. Selected contributions will get published in our journal.